Pictured is the Northants Bowling Federation team that won the national Adams Trophy inter-county championship for the first time since its inception in 1927. From the left are, back, Martin Welsford, Paul Bailey, Martin Stokes, Peter Brown, Adam Warrington, Steve Roden, Lee Welsford, Jonathan Earl, Stephen Harris, Neil Wright, Graham Agger, Nick Wilkie, Paul Dalliday, Sean Fenlon, front, Roger Stevens, Paul Buckley, Fred Richardson, Bob Warters (county president), Cliff Watson (team captain), John Dickenson (recipient of an award from the EBF), Roger Martin. Local bowlers and supporters painted Skegness the county colours of orange on Sunday as Northants Bowling Federation celebrated winning the Adams Trophy for the first time in their history. Northants had not even reached the final of the English Bowling Federation’s premier inter-county championship for almost 60 years, so to achieve that milestone and then go out and out-bowl Northumberland 178-145 was the icing on the cake. The emotion of winning the title coincided with an EBF award for Northants’ John Dickenson, a loyal county and national servant in a number of roles, including president and chairman, who rose from his hospital bed following a serious operation to witness history being made and also be involved in the celebrations. He also paid tribute to all the players who had taken part in the campaign. The Suncastle green was almost completely surrounded by Northants supporters, many wearing orange T-shirts bought for the occasion, and the players responded by grabbing the early initiative. Roger Martin’s rink set the tone by racing into a 12-0 lead with rinks skipped by Paul Buckley and Lee Welsford also taking the upper hand and by midway Northants held a slender but significant 11-shot advantage. With the trios skipped by Peter Brown and Martin Welsford struggling to cope with tricky end rinks against talented opponents, it was left to the four middle rinks to maintain Northants’ momentum. 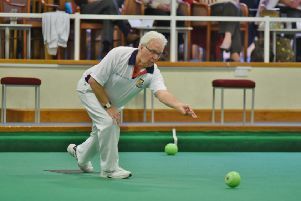 As the rinks skipped by Martin, Buckley and Lee Welsford stretched their advantage with the winning line in sight, Jonathan Earl’s rink fought back from a 10 shot deficit to run out 31-23 winners. Steve Roden, Graham Agger, Peter Brown lost 21-30. Martin Stokes, Nick Wilkie, Paul Buckley won 30-17. Sean Fenlon, Bob Warters, Roger Martin won 35-16. Stephen Harris, Paul Dalliday, Jonathan Earl won 31-23. Adam Warrington, Fred Richardson, Lee Welsford won 42-18. Roger Stevens, Paul Bailey, Martin Welsford lost 19-41.